It’s pretty widely known that cannabis, due to its anti-inflammatory benefits, can help alleviate pain. Of course, there are various types of pain. Most likely, someone who has sore muscles after a three-hour hike is having a different experience than a person who is dealing with chronic pain. There is also localized pain, in one part of the body, compared to all-over pain. Can cannabis tell the difference between these kinds of pain? We talked to Dr. Allan I. Frankel, Internal Medicine Physician and Medical Cannabis Specialist of Greenbridge Medical in Santa Monica, California, to find out. First, how does cannabis work to relieve pain? “Both our pain receptors and cannabinoid receptors are closely related,” explains Dr. Frankel. “Pretty much any time we use cannabis of any type, opiate and cannabis receptors are activated. This generally leads to less pain in general.” Dr. Frankel says that treatments can vary when it comes to localized pain and all-body pain. “There are topicals and systemic forms of cannabis for both local inflammatory-based pain, as well as, for example, neuropathic pain,” he says. For localized, or neuropathic pain, Dr. Frankel says to treat topically with a combination of CBD and THC. On the other hand, systemic, or all-over pain, would need systemic therapy. This would pertain to sublinguals or oral capsules. Frankel also says we will soon see new cannabinoids, such as THCV, being used to treat pain. “Over the next year, keep a lookout for topical products containing THCV,” Dr. Frankel says. “This is a very rare cannabinoid that proves to be helpful with pain of many types.” THCV, or tetrahydrocannabivarin, is a minor cannabinoid found in many—but not all—cannabis strains. It’s different from THC due to it only becoming psychoactive depending on the dose. It may also be beneficial for bone health, fighting anxiety, and aiding in weight loss. No wonder Dr. Frankel thinks we’ll start seeing more of it. When using cannabis for pain relief, Dr. Frankel recommends starting low and going slow. “At the same time, adding a bit more THC to your CBD tincture may cause a bit of loopiness, but often that is much better than pain.” Basically, a buzz might be worth it, especially if it gets rid of your soreness. For localized pain, try Dr. Kerklaan Natural Pain Spray, Papa & Barkley Releaf Pain Patch, Papa & Barkley Releaf Balm, and Apothecanna Extra Strength Body Creme. 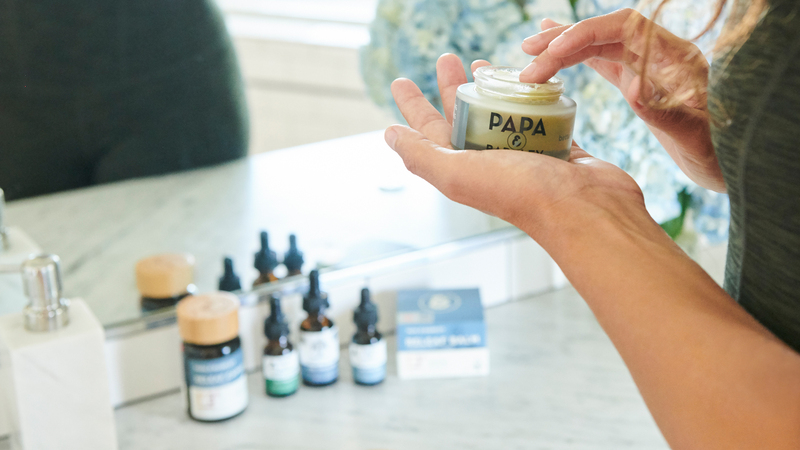 For all-over pain, try Papa & Barkley 1:3 Releaf Capsules, Allegiance Wellness RSO Tincture, and Papa & Barkley Releaf Tincture - 3:1 THC/CBD. Still have a craving for more cannabis related information? Have a look at this article that will teach you more about cannabis and your body.